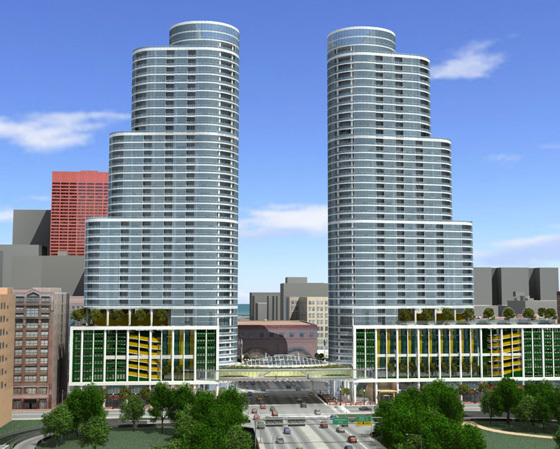 This twin tower development of 55-stories is quite prominently placed upon the ‘Axis of Chicago’ that is a major Gateway arrival from the western Expressways into the center of the city and Grant Park/Buckingham Fountain. In addition to numerous LEED sustainability features, the very special design features a highway-spanning ‘skypark’ with an attached pedestrian overpass across the busy eight-lane highway. This is all reached by flanking, twin Wintergarden spaces that will be landscaped and contain fountains and sculptures as well as escalators to the overpass. This safe access pedestrian way avoids the city’s most accident plagued intersection and links the South Loop Residential Neighborhood with the office and financial center immediately to the north.